Kale pesto, in my opinion, is only surpassed by traditional basil pesto. 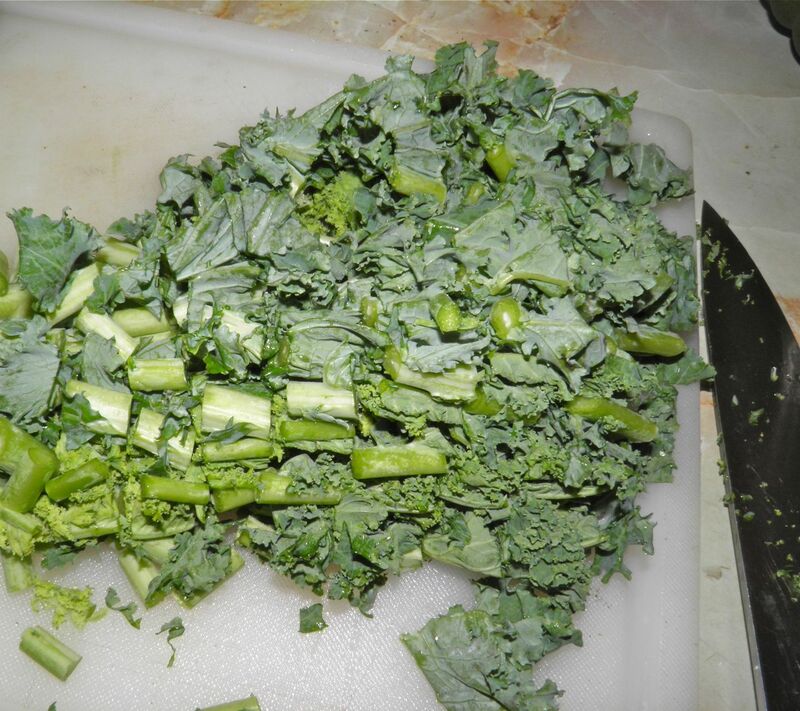 Many people don't like kale. That's a real pity. It's extremely good for you. I have also proved over the past week that you can get three distinctly different meals for four out of one standard-sized bunch of kale. Of course this is kale being used as an ingredient (as opposed to a side dish) in three different meals. But one bunch of kale it was, coming in at about $1 per meal. The first recipe was Beef and Kale. This recipe combined kale with hamburger, chickpeas, corn and tomatoes into a very filling, and nutritious soup. Yesterday I posted recipe number 2: Sauerkraut, Sausage and Kale bake. This was a twist on the old Nova Scotian German favourite, sausage bake. Today it's recipe number 3. If you're getting a little tired of kale by now you're in luck for two reasons. Reason one is this recipe will keep in the refrigerator for several days. Reason two is that it really doesn't taste like kale at all. As you can imagine my bunch of kale was starting to get down a bit in volume. I had a few inches of green leafiness and then the stems. The stringy, tough stems… What's about the only thing you could do with them except make a purée? And then it hit me. Green. Vegetable. 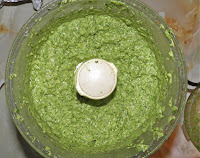 Purée... Pesto! Although purists will say that you should only ever (EVER!!!) 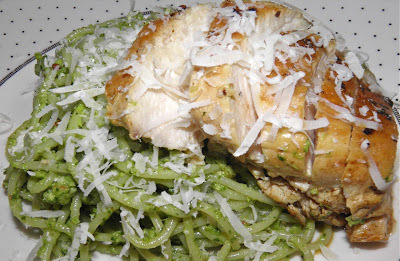 make pesto with basil, you can pretty much make "pesto" with any herb or vegetable that won't crawl away from you. 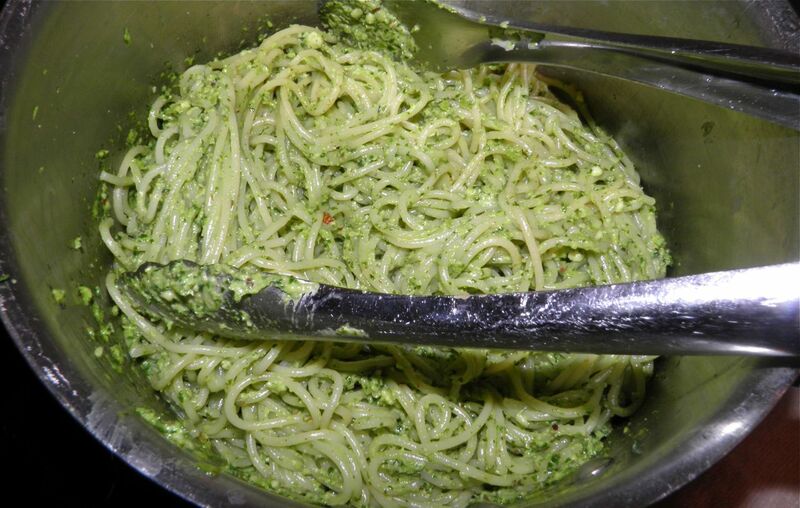 The name "pesto" comes from the Italian word pestâ, which means to pound or crush, in reference to the traditional method of preparation with mortar and pestle. So as long as you're pounding something into a paste you can engage in a war of semantics with whoever questions you on this recipe. I have successfully made cilantro pesto, Italian parsley pesto, sun-dried tomato, and if I remember correctly dandelion green pesto. If I haven't written about it I probably will this spring. 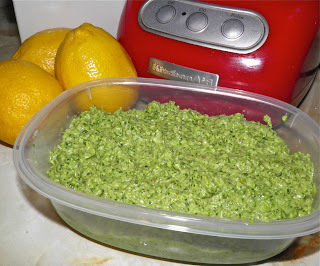 Of all the different pesto I have made I do have to say I think my favourite after basil may be kale. There's a peppery taste to the kale that is not too bad at replicating the pepperiness in basil. 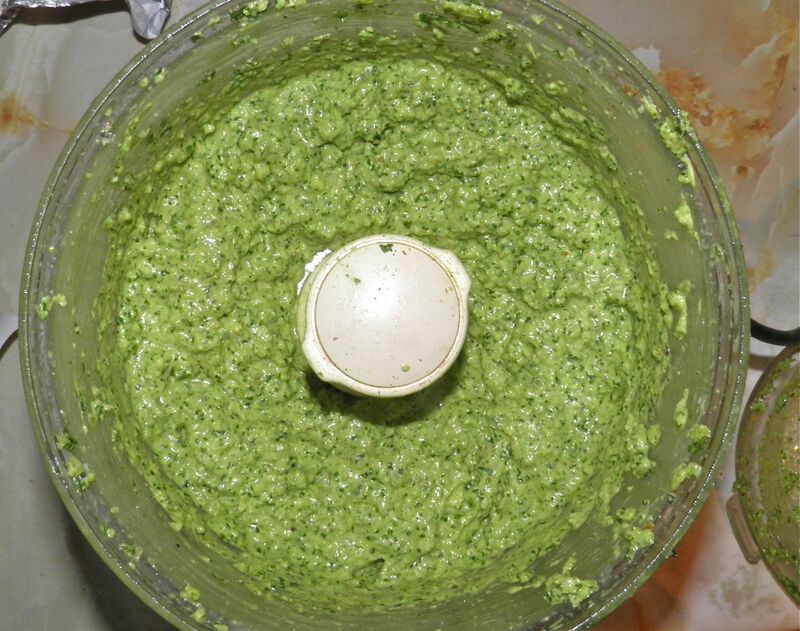 So what does it take to make pesto? Only a few ingredients. You need garlic, something green (most times), olive oil, parmesan and nuts. Traditional basil pesto uses pine nuts, which are very expensive. I have used walnuts and pecans in some of my non-standard mixtures. Don't use peanuts. They have too recognizable a taste. I had almonds on hand so in they went. We had our kale pesto pasta topped with seared chicken breast. A fine, frugal and delicious meal, to say the least. Place the almonds in a food processor and process until ground to a rough consistency with no large pieces. Add the garlic cloves and pulse until combined. Then add the kale and pulse until nearly smooth. With the motor running slowly add olive oil until you have a mass inside the processor bowl that moves relatively freely. You don't want a liquid, but it needs to be "loose." Scrape down the sides as necessary. Grate the parmesan and add to the pesto, with some salt and pepper. Pulse again just until combined. You want small pieces of grated cheese to remain. Cover tightly and refrigerate until ready to use. To "loosen the sauce" before using either add a little pasta cooking water or some cream just before adding to pipping hot spaghetti. * This volume depends on if you have more stems or leaves. Leaves will take up more volume than the dense stems. Questions? Comments? Derogatory remarks? Just ask! I’ll answer as best I can. If you like this post feel free to share it using any of the links. If you repost, please give me credit and a link back to this site. Easter Baking: Hot Cross Buns! Pizza Buns! My guiltiest pleasure. Spring is springing. Time to prepare.